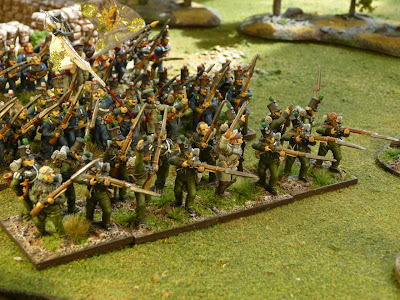 You may remember that late last year I posted photos of 24 figures of a combined Prussian battalion, I had screwed up the figure order, so had only 1/2 the required figures for each battalion, and at the time did not have the fusilier figures. 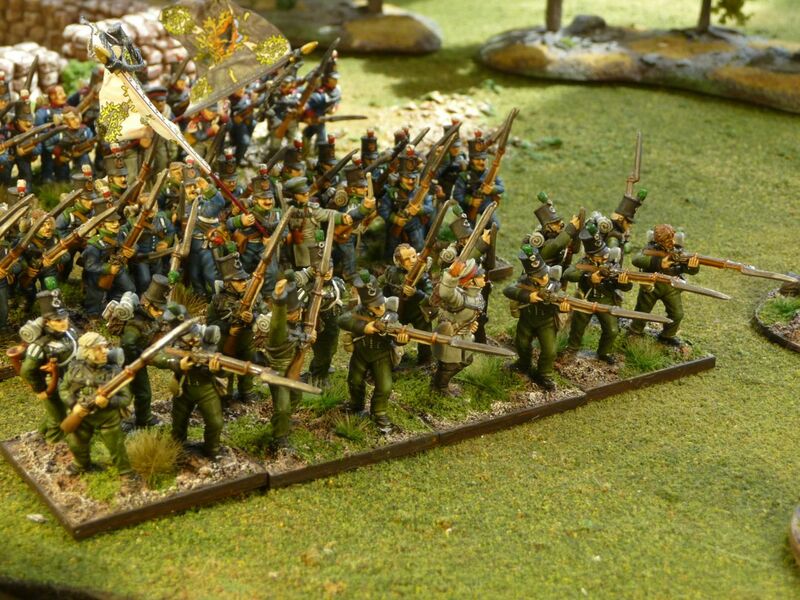 I said that I really wanted to paint the whole regiment, so here we have Reserve Infantry Regiment 9 in it's entirety. During the Waterloo campaign it entered into the Prussian Order of Battle as IR21, or the 4th Pomeranian Regiment. What was particularly attractive about this regiment is that the men were still in their British uniforms originally supplied in 1813, during the Battle of Waterloo. They do break up the sea of blue. Fusiliers in their "Rifles" uniforms. 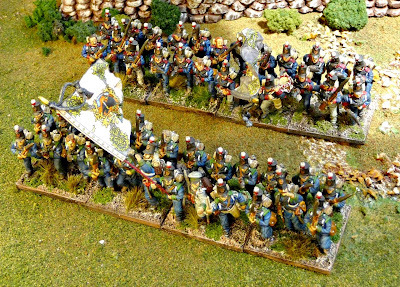 3/RIR9 based as skirmishers. In order to decrease the number of figures I have to paint for my Prussian project, I have decided to use 4 figure bases for the 3rd Fusilier battalions, rather then 6. I forgot to place the jagers in the photo, each Prussian regiment will have 4x2 figure bases of jagers attached to the 1st battalion. New round bases for all sub commanders . Hard to say anything bad about Calpe figures and Flagdude standards. 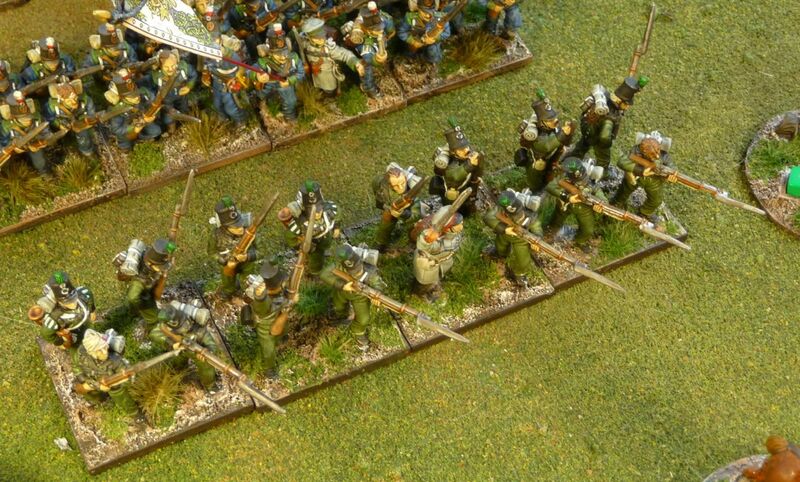 Excellent nothing beats the effect of massed bayonets! Great looking toys - makes me want some reservists in British uniforms for my Prussians! Nice work! 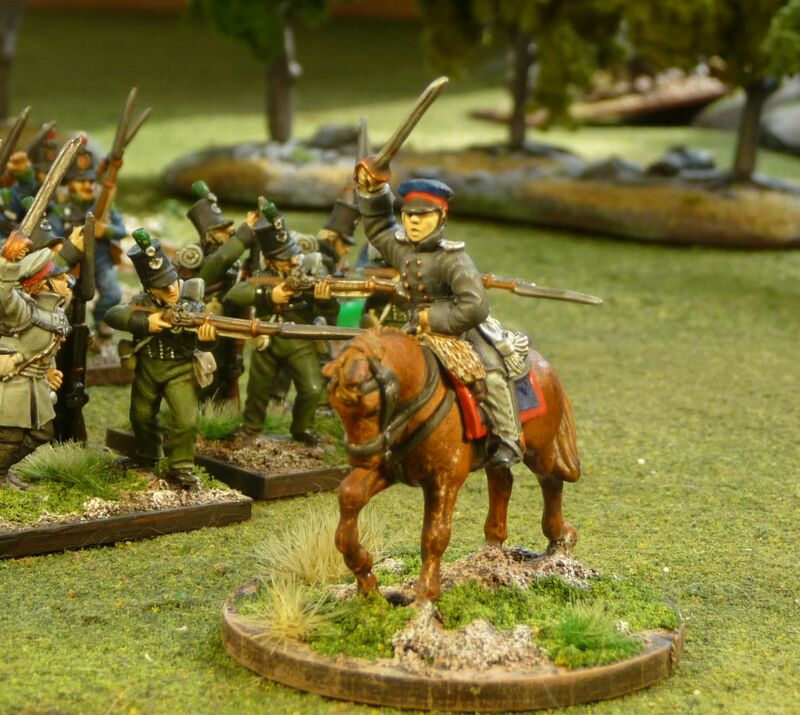 always good to see more Prussians coming to life. 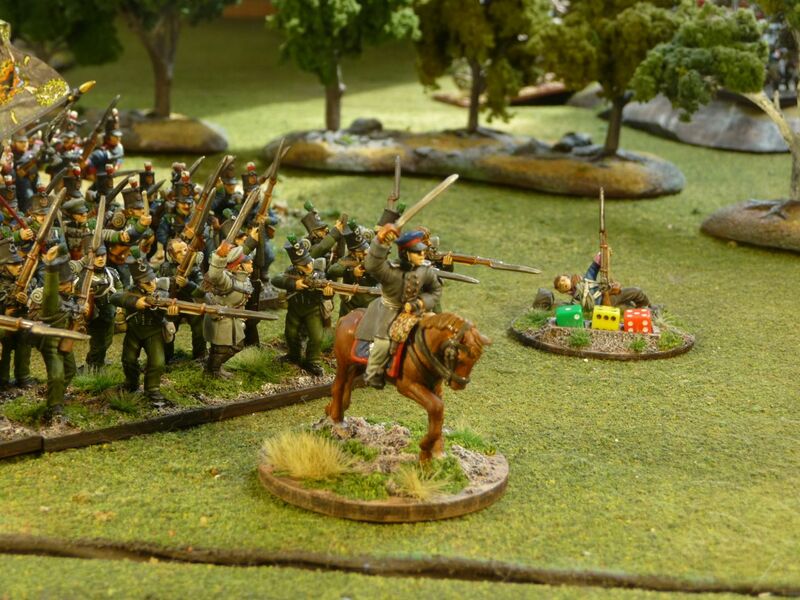 Did you use a different technique on these guys from your cavalry? Great looking work - sometimes after seeing your stuff I just need to put my brushes down and bow to the master! Thanks, I enjoyed painting the figures, it is a nice little goup. 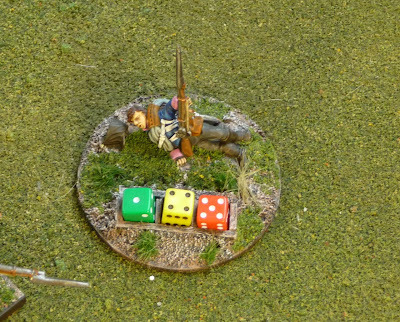 Always the same way, very simple technique, I am painting an unit of landwehr now about 20 min per figure. 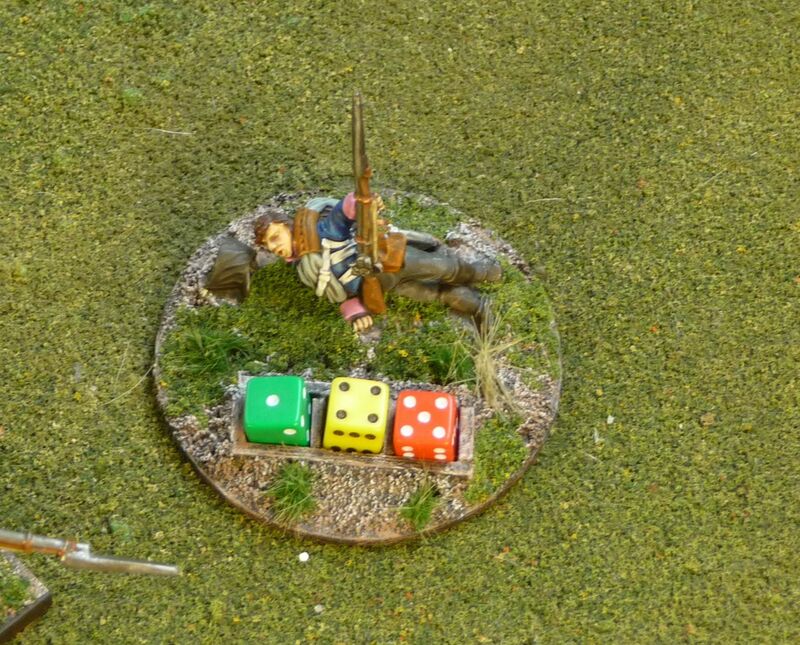 Nice casualty marker! Will have to pinch that later on when I get back to NAPs.. Fantastic painting on these John. Very impressive looking. 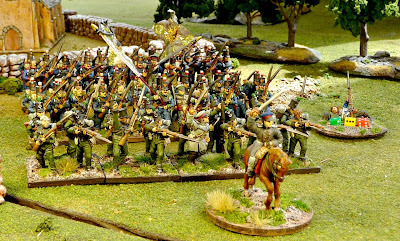 A great looking collection of figures and terrain. Great looking force John. Can't wait to see them 'in the flesh'! 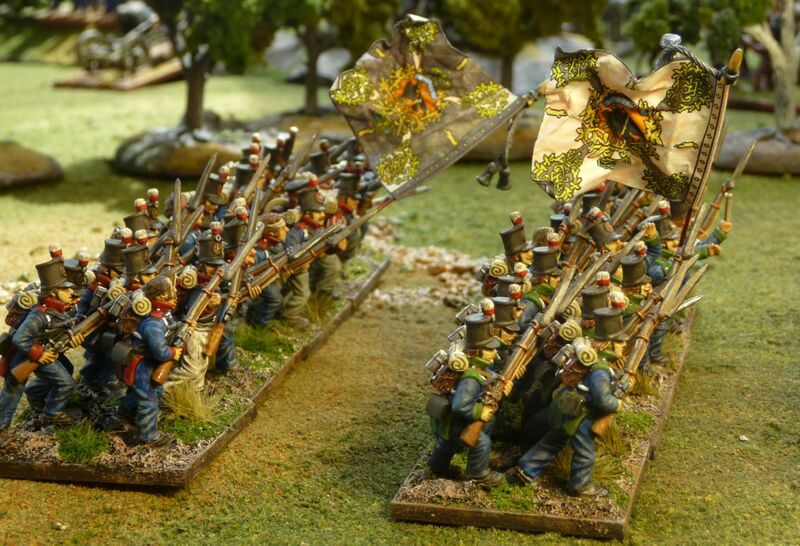 An impressive and beautiful batch of Prussians! You casualty figure turned out very nice as well. I look forward to hearing about your game with Iannick in Montreal. Have a nice trip! Very nice painting on these. I've painted that regiment myself not too long ago. Very interesting choice of uniforms they had too. Lovely work John, have you played many battles with these units to date? Hello, could you please let me know of any way to contact you? I would be very interested in knowing more information about Oberst von Reckow.